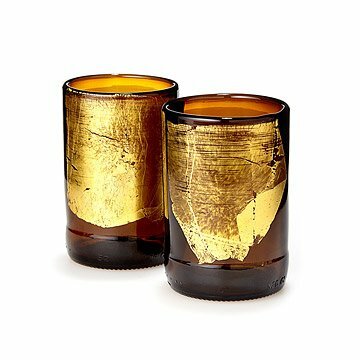 Bring artful luster to the table with these tumblers, made from upcycled glass and 23k gold leaf. A work of art isn't merely beautiful, it helps you to see the world around you in a new way. That's what glass artist Nanda Soderberg does with these resourceful glasses. He takes something that was once disposable - a beer bottle - and cleans and polishes it to reveal its sparkling amber color. He then cuts it into a petite, 6 ounce drinking glass, and fire-polishes the lip to perfect smoothness. Instead of the label it once carried, it is given a shimmering, abstract splash of 23K gold leaf across the front portion of the vessel. The gold leaf is fused with the glass, so that it will not scratch or wear off. Coming in a set of two, the artist's vision makes these glasses not just a glass, but an experience that enhances whatever you sip from them. Made in Manchester, New Hampshire. Nanda Soderberg started blowing glass at the University of Hawaii in 1994 and was instantly struck by the immediacy of the process. He has always been attracted to activities that are fast paced, require extreme focus and involve a degree of risk. Blowing glass was a natural fit. In 1999 Nanda received his BFA in glass and left Hawaii to gain experience working in production glass shops in Seattle and California. In 2005 he moved to Virginia to pursue his Masters degree in Art. Since receiving his MFA in 2007, Nanda has taught at Virginia Commonwealth University, California State University Fullerton, Haystack Mountain School of Crafts, and Pilchuck Glass School. Nanda is driven by the idea of taking a found glass object, something that may have had a single use or is heading for a landfill, and transforming it into something that can be used indefinitely. Nanda works in a studio without a glass melting furnace re-configuring found glass objects through traditional hot and cold glass working process. He plans to continue his experimentation and research with found glass, tackling design and production challenges head on to provide the consumer with unique products. Dishwasher safe. Not microwave safe. Not intended for hot liquids. Not super thrilled with these. I've always loved everything I've bought from your site but these are disappointing. I read all the reviews but didn't realize how sort of boring my gold leafing would look when they arrived. Of the 4 I bought, 3 are just a square of gold. It sort of looks like the beer bottle label got peeled off. It looks kind of crummy that it doesn't go all the way around, and I think the picture showing the side/back of the glass wasn't there when I purchased. It would be better if there was some artistry to the gold, ie it didn't just look like a square slapped on there. I'm stuck with them because our anniversary is soon and I need something gold for #14, but I'm more excited about the craft beers I bought to go with the glasses than the glasses themselves. Oh well. The picture made these glasses look like they were gilded all over. In fact they look like beer bottle bottoms with a small gold smudge. So very beautiful, and useful too! I bought these for my partner for their birthday as they like quirky kitchen and dining items, and they were very pleased with how sparkling and smooth the tumblers are. Nice and light glass. The gold leaf makes it unique, especially because it is not the same on every glass. My only con was that the glasses I received did not have much gold leaf on them in comparison to the online picture. Tumblers smaller than I thought and the gold leaf was only in the front of the tumbler, not all the way around. Great addition to the bar! Love the glasses, but their light weight makes them seem a little cheap. I bought this as a wedding present for a friend who is really into beer and her husband is a master brewer. She loved the gift, they are very pretty, delicate and unique. They were smaller than I had envisioned, the gift seemed a little plithy when I gave it to her, but she gushed over them and the is very good. Unique gift idea for someone who loves beer but you don't really know what to get them. Slightly small but cool concept. Would buy again for someone.